As I write this note, probably hundreds if not thousands of shorebirds are heading south to the wintering grounds. Some make stopovers along Florida’s coast, others fly straight from stopovers in the northern states to the coast of South America. As shorebirds look for suitable sites to spend up to 9 months in their wintering grounds, biologists with the Pan-American Shorebird Banding Program also start preparing for a new banding campaign. 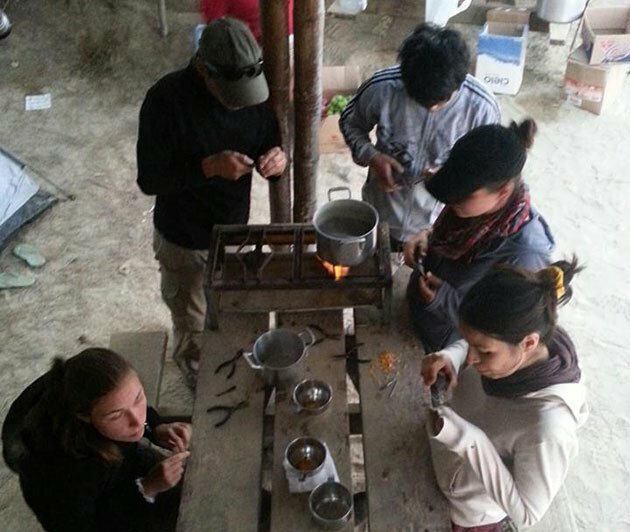 I am familiar with the shorebird banding program in Peru, as the programs is run by CORBIDI, a small non-government organization (NGO) dedicated to the study and conservation of birds, other wildlife, and their habitats. I am an associate with this NGO and follow the progress of the banding program. Eveling Tavera, a research associate with CORBIDI is Peru’s national coordinator for the banding program. She certainly deserves recognition for her dedication and tireless contribution to the understanding of wintering shorebird ecology and conservation. The old practice of putting a small, inscribed, metal band on a migratory bird’s leg to mark and track its location and movements for research purposes still continues today. This method of marking largely relies on recapturing the bird in order to read and record the band data. More recently, plastic color bands and “flags” were developed in order to detect marked birds from a greater distance, allowing researchers to know by sight where a bird was first marked, without having to recapture it. The Pan American Shorebird Program developed a standard marking system, assigning one flag color to each country in the Western Hemisphere. In more recent years, color flags with alphanumeric inscriptions have been employed, making it possible to identify individual birds, not only cohorts, by sight. 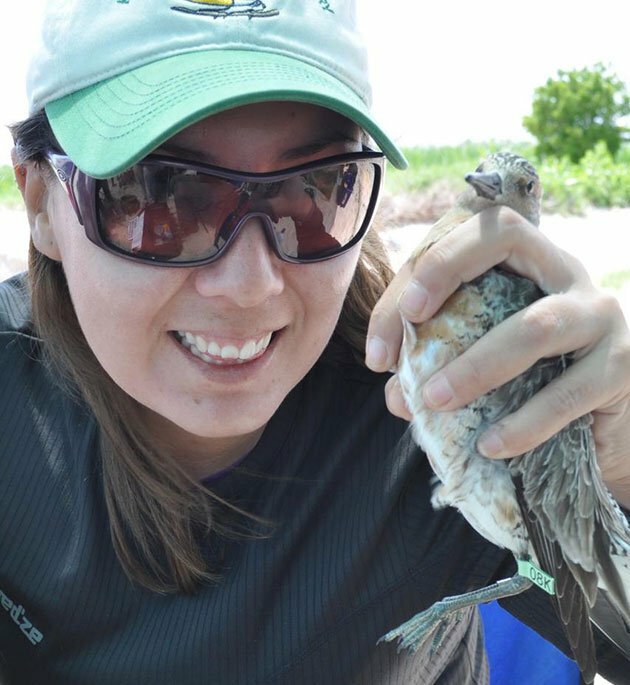 Eveling and her team have banded well over 2,500 birds since the inception of the program in 2010; mostly Western Sandpiper, Semipalmated Sandpipers, Sanderlings, and Semipalmated Plovers. 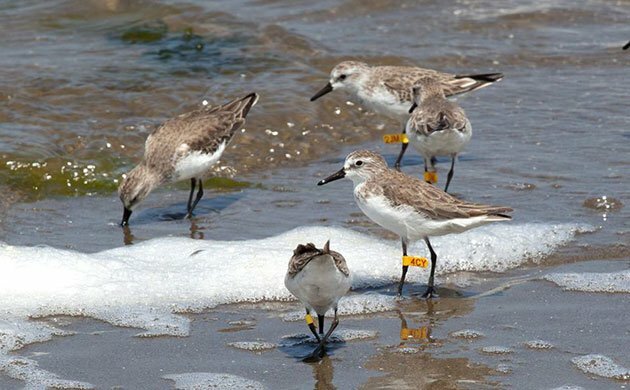 Recaptures of banded birds runs around 4.7%, which is surprisingly low assuming wintering shorebirds tend to return to the same general area every year. Resightings run around similar low percentage. The program is only three years old and over time more details leading to better understand the wintering ecology of migratory shorebird will be revealed as more birds are banded in a greater number of sites throughout South America. A web-based initiative www.bandedbirds.org has been developed by partners in New Jersey and Delaware (USA) to incorporate shorebird sightings (or resightings) made by the public into a centralized database. To start, they entered nearly 72,000 shorebird banding records and 84,000 resighting records from established research programs. Since the website’s launch in May 2009, an additional 5,300 banding records and over 30,500 resighting records have been entered! Even more exciting has been the public response, with over 7,000 resightings reported in less than a year by recreational birders spanning the Western Hemisphere, from Canada to Chile. 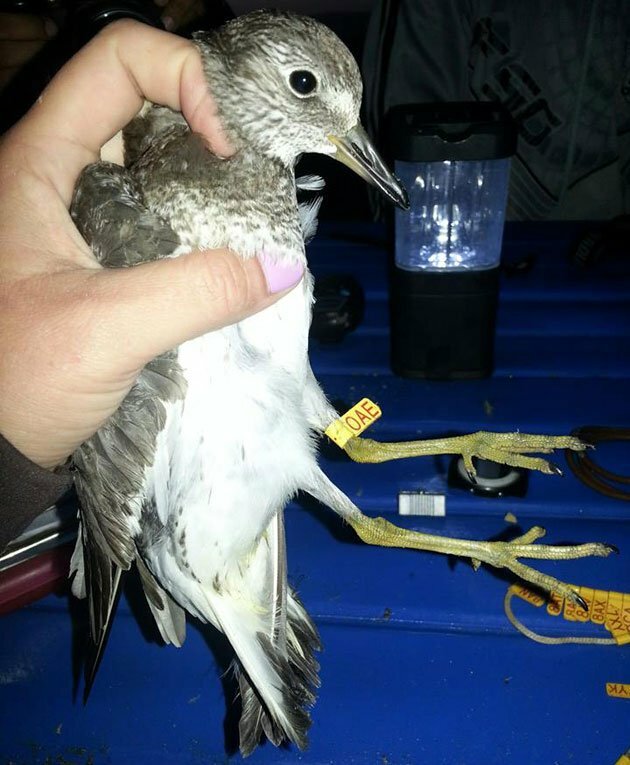 If you see a shorebird with a yellow flag you will know it was banded in Peru. Regardless of the flag color, if you see a shorebird with a conspicuous flag, please report it at the website provided above. 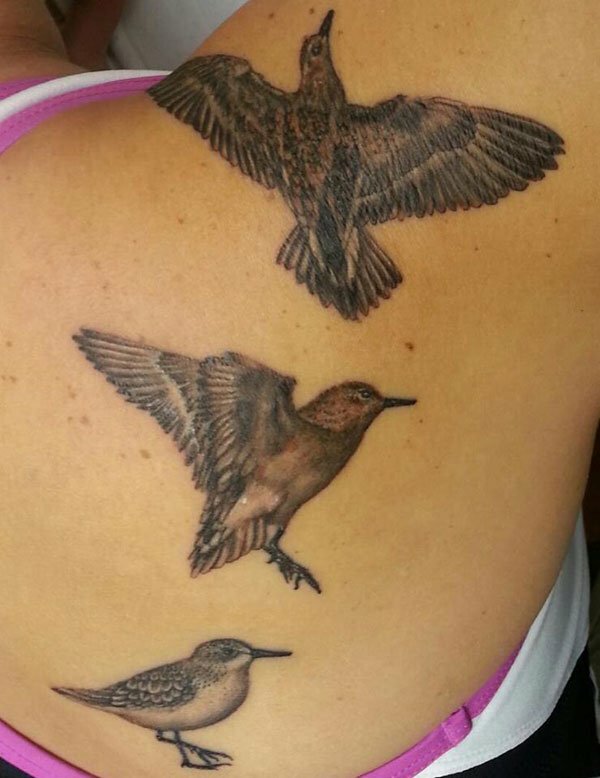 I love when recreational birders (like me!) can help with banding projects by looking for and recording banded birds. Great article! Thank you Erika. It takes the entire community to make this successful!! Great post! Good luck with this project. I’m curious whether you think any of these birds will be found here on the West Coast of the US? Thank you Wendy. Yes, birds banded along the Pacific Coast of Peru are likely to show up along the West Coast. In fact, a few birds banded in Peru have been sighted along the West Coast. Others along the East Coast in north Florida. All of this helps figure out what routes these birds are taking to fly south and what route to fly back. We use yellow flags here in northern Western Australia as well, but the two “flyways” should not overlap!! We use two digit and three digit flags at present, as well as colour bands on four species of shorebird. Hello Clare and Grant, that’s interesting. I did not know the same color was using elsewhere. As you say these are different migration routes with little chances for bird here and there to come in contact and being confused. We do have to be careful as Hong Kong use yellow and white engraved leg flags and if the bird fluffs up you can’t see the white flag and then it is presumed to be one of “ours”! Often we receive photos, which are very useful! The metal band position and flag positions are important on all species. What an awesome project! We will be watching for flagged birds in Costa Rica. Some birds are known to stop in Panama. I am sure some stop in Costa Rica! ¡Best wishes and buena suerte!